Tadano Oceania Pty Ltd has moved to a larger facility in Sydney to meet the needs of a growing business. After less than two years of direct representation in the Sydney market, Tadano Oceania has expanded and relocated to the larger premises in Wetherill Park, which is wholly dedicated to the sales, spares and service of Tadano cranes. Situated in the dynamic western industrial hub of Sydney, the new Tadano NSW branch office is headed by Justin Andrews in sales, Amanda McKenna in administration and parts support, and Noel Henderson in the service department. The new 1600m² site at Nello Place in Wetherill Park has excellent access with off street parking for both cranes and visitors. Very close to the M7 Freeway, the new office is an easy 45-minute drive from Sydney airport. The warehouse provides ample space for new cranes, parts store and service workshop. Pointing out that the move was further evidence of Tadano’s commitment to customers in the Sydney and NSW markets, Justin Andrews observes there are massive opportunities for the Tadano brand in these markets and a direct factory presence is essential to increase sales. 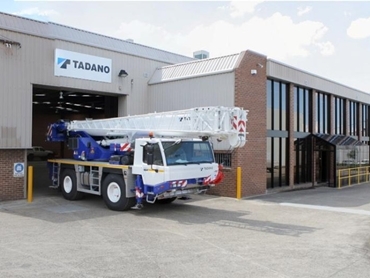 The new premises will allow Tadano to carry and stock German, Japanese and American Tadano cranes, which are relevant to the NSW market. These include the Tadano ATF40G-2 and ATF 70G4, both all terrain cranes as well as the popular truck crane, the Tadano GT600EX. While Tadano’s new facility is set to house a range of fast moving parts for Tadano crane models popular in the NSW market, additional parts support is available on an overnight basis from the main Tadano parts warehouse in Brisbane. Tadano is a world leader in the crane industry with the Tadano range including all terrain cranes, truck cranes, rough terrain cranes and Tadano Mantis telescopic boom hydraulic crawler cranes.